Peat joined us on the grouse opener today, and the 5-month-old fit right in. At first, he tried keeping up with Angus through the sagebrush, ceanothus, and Hawthorn, yipping and yapping all the way, sounding like Flipper. Soon he must have realized he couldn’t keep up and began going his own way, staying close enough but definitely following his nose until he sensed he needed to check in with us. His tough spirit, which I’ve complained about, seemed to translate into an eager sporting dog. I am excited. We saw no galliformes, save a lone chukar Peat bumped, and hiked for a couple hours in both open and dense vegetation. Angus covered the ground I’m used to seeing him dance over, no sign of slowing. Two more weekends of this, then it’s on. Yay. Thanks for the email. Please continue to keep me in the loop for more stories. I always enjoy the letters and the photos. Sure thing, Dale. Thanks for reading. I hope you have a great start to the season, and that the drought down there hasn’t too negatively impacted your favorite spots. No birds eh? I found some blues up high above Garden Valley, but not as many as I expected given the mild winter. If you drive up Mill Creek in Council there was excellent grouse hunting in that area when I used to live up there. Lots of ruffs down low, and blues up high on West mountain. As much as I enjoy hiking the high ridges, I too am just passing time till I can get into the chukar hills. I have a new to me English pointer that I spent part of the summer getting steady to wing and shot, so I’m looking forward to see how she does. I can’t wait to see Porter work either. I know the areas you’re talking about, Chris, and might try them before chukar opens. I like to look for blues in the open, but it’s a crap shoot doing that. Saw lots of them this summer but just wasn’t lucky the other day. Enjoy your new pointer; sounds like she’s going to be great. I’m looking forward to watching Peat’s journey. Watching a young pup grow into a hunting machine like Angus is full of surprises. Thanks, Larry. I’m expecting lots of surprises from Peat, indeed. Best of luck to you for the start of the season! Really enjoy your blog. We don’t have any wild chukars here in NC, but we are relocating within the next three years and Boise is on the list of possibles. I’m in the market for a new vest/pack and wondered if you have tried the one made by Buck’s Bags in Boise. I’m a pilot and layover in Boise often and thought about picking one up next month. Also, have you ever made it to the Grandfather Mountain Highland Games? Thanks for your comments, Andrew. My first vest was a Buck’s Bags vest. I used it twice. It didn’t fit well, and the shell pockets, located on the front of the vest, banged into my quads while walking even slightly uphill. Useless as a chukar vest. But very well made. Maybe they’ve changed the design. I am really enjoying the Badlands vest I reviewed. I’ve never made it to the Grandfather Mountain Highland Games. It looks like a blast! If you decide to move to Boise, let me know. Great meeting you! Good luck this season have fun with the dogs, be safe. Thanks for having us in Cambridge. Thanks, Steve! Have a great ride – sorry for the bad weather and re-routing of your ride. 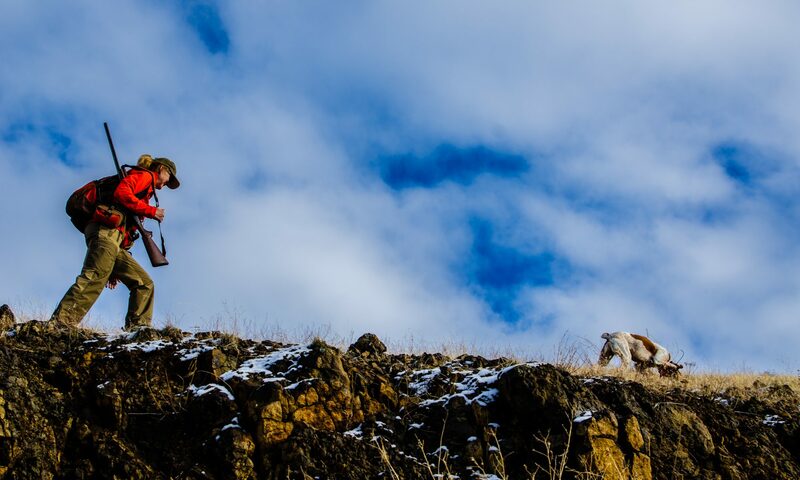 If you ever get out this way during chukar season, let me know. Good luck on the grouse this season!